Christianity101: The Catholic Confession EXPOSED! 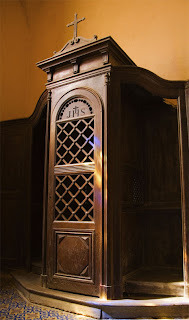 "The Sacrament of Penance and Reconciliation is a Sacrament in which we are sorry for our sins, confess them to a priest, receive forgiveness for them and are reconciled with God and the Church." What a bunch of lies! No priest can forgive anyone's sins. He can't even forgive his own sins! Come to think of it, who does forgive the priests sins? Does he go to confession too? If the priest goes directly to God, then why can't you? Even the corrupt religious leaders of Jesus' time knew that only God can forgive sin. The word “Sacrament” is NOT even found in the Word of God, nor is it found in the Douay version (the Catholic Bible). The definition of “Sacrament” is: "A formal religious act conferring a specific grace on those who receive it.” The teaching is that there is a “power” to the Sacraments. This false teaching is NOT taught in the Bible. The Seven Sacraments of the Catholic religion were first affirmed in 1439 A.D. 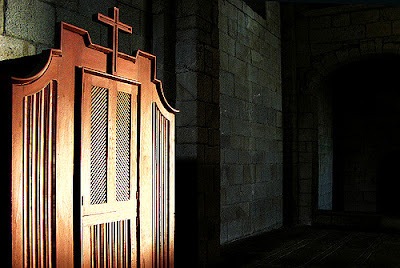 There is NO power conferred through being water baptized, going to confession, partaking of Holy Communion, et cetera. The Lord only instituted the ordinances of water baptism and the Lord's Supper; BUT, they do not bestow any grace, or any effect, upon the believer. When you get baptized, you are getting wet. Too many religions today have baptism on the brain, and have perverted the simple Gospel of Jesus Christ by sinfully requiring baptism for salvation. You do NOT have to be water baptized to go to Heaven. 19And he took bread, and gave thanks, and brake it, and gave unto them, saying, This is my body which is given for you: this do IN REMEMBERANCE OF ME. The Lord's Supper (Eucharist) was simply something which Jesus wanted believers to do to REMEMBER Him ... no more. The Catholic religion has perverted the Lord's Supper into a monstrosity with three heads, tens eyes, and sharp venomous fangs. It's called “transubstantiation.” Some even call the Catholic practice of Mass, cannibalism, since Catholics believe they are literally digesting Jesus' flesh and blood. The belief is that the flesh and blood of Christ digest into the human body; thus, giving it's recipient spiritual strength and renewal. The logical conclusion then must be that one passes Jesus out in their feces as well. What blasphemy!!! BUT, Jesus also claimed to be the “Door” in John 10:9. Was Jesus a literal door? A literal loaf of bread? It is obvious in John 4:10 that Jesus wasn't offering the Samaritan woman actual water, but living water, the Holy Spirit. The Catholic religion has no right to pervert the plain teachings of the Word of God; but they do horrible and sinfully. Our spiritual life is nourished by the Word of God. It is the Holy Spirit of God that empowers and strengthens believers. The crazy idea that the Catholic mass has some special power to it is absurd, and unbiblical. The catholic religion is dangerous, teaching people false religion, leading one billion souls into the lake of Fire. The Bible repeatedly condemns self-righteousness. 3For they being ignorant of God's righteousness, and going about to establish their own righteousness, have not submitted themselves unto the righteousness of God. 4For Christ is the end of the law for righteousness to every one that believeth. Study all of these Scriptures in the King James Bible and you will find that I am telling you the Gospel truth. The Pope is a liar, who claimed in 2005 that a person doesn't even need Biblical faith to enter into Heaven. The entire concept of Catholic salvation is corrupt, very similar to the hellish teaching of Lordship Salvation being propagated in unsuspecting, carnal, ecumenical and apostate churches today!!! It is evil and a road to Hell. The Gospel (good news) of Jesus Christ is the POWER which opens the gates of Heaven to those who obey it; BUT, it is also the POWER which will send them to Hell forever if they do not obey it. Jesus simply explained to the Apostles that by preaching the GOSPEL, they held the keys to Heaven and Hell. Those who believed the Gospel were forgiven; those who didn't weren't. The Gospel is the key to Heaven or Hell, depending on whether you obey it or not. To claim that Jesus gave the Apostles the power to forgive sin is blasphemy. We've already learned that there is only ONE MEDIATOR between God the Father and men, the man Christ Jesus. We've also read in Mathew 6:15 that God requires us to forgive others who seek our forgiveness, it's not an option. In addition, not one mention is made anywhere in the New Testament of an Apostle ever forgiving someone's sins. This FACT alone speaks volumes against the Catholic religion. Out of all the sermons recorded in the New Testament by the Apostles, not one mention is ever made of an Apostle having the power to forgive someone's sins. When Stephen preached the Gospel in Acts 7, he never offered to forgive anyone's sins. When Peter preached the Gospel on the Day of Pentecost in Acts 2, he never offered to forgive anyone's sins. When Paul witnessed to King Agrippa in Acts 26, he didn't offer to forgive the king's sins. Notice what Peter said to Simon, the former sorcerer, when Simon tried to buy God's power ... “Repent therefore of this thy wickedness, and pray God, if perhaps the thought of thine heart may be forgiven thee.” The Apostle Peter told Simon to pray to GOD for forgiveness! 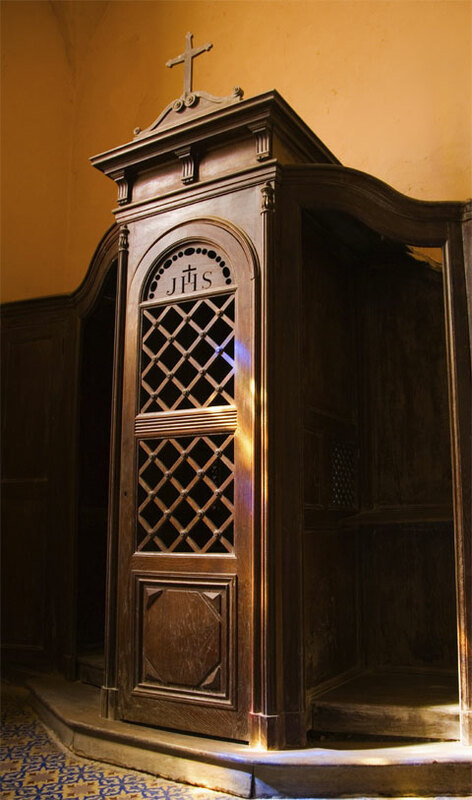 Peter didn't claim the power to forgive Simon's sins, nor did Peter tell him to go find a confessional booth. In all the letters (Epistles) which the Apostle Paul wrote to the New Testament churches, he never mentioned or taught anything about the power to forgive another's sins. Clearly, the Catholic Church is lying! Carefully notice that the man didn't ask the Pharisee to forgive him, nor did he go to the priest for forgiveness. No, the publican went to GOD ALONE! I marvel at the willingness of the victims of false religion, to follow the traditions of men, instead of the teachings of the Word of God. 8It is better to trust in the LORD than to put confidence in man. But, asking God three times for the same thing, is very different than mumbling the same dead words (the Rosary) over and over for a lifetime. Furthermore, this was not the norm when Jesus prayed. There are times in our life where we will want to keep asking God for something; but, that is certainly not the same as mumbling the same WRITTEN, dead, repetitious, religious, words over and over. A Catholic repeats 52 “Hail Mary” in each DAILY Rosary prayer. Jesus clearly stated that the “heathen” pray with useless repetitions. Since Catholics claim that their repetitious Rosary prayers are not “vain repetitions”; then I ask, who was Jesus speaking about? Do you realize that a faithful Catholic who prayers the Rosary every day, will in a lifetime say “Hail Mary” well over 1,000,000 times!!! Think about it. And yet, not one mention is made of the name of Jesus Christ in the Rosary. Like it or not, the Word of God condemns formalized religion. It is abundantly clear that the nuns who are chanting the Rosary are praying with VAIN REPETITIONS. This is just one example of a manmade tradition, not taught anywhere in the Bible. The Rosary was invented in 1090 A.D. If you trust in man, you WILL be greatly disappointed at The Great White Throne of Judgment one day. If you trust upon Jesus Christ as your personal Saviour, Jesus will not fail you. I plead with you as a loving friend, forsake the Great Whore of Catholicism, and turn to Jesus Christ alone! Follow the Word of God; not the religion of men, who make a living off of victims like you.